Tiger Woods still has more majors than comebacks. But the gap is narrowing. Woods said he will return to competition at the Hero World Challenge the week after Thanksgiving – an 18-man field in the Bahamas with no cut – just over seven months after fusion surgery. That was his fourth back surgery in a little more than two years, and that alone should be enough to temper expectations. This will be the 10th time that Woods has returned from an unscheduled break of two months or more, eight of them since winning his 14th major at Torrey Pines in the 2008 U.S. Open. And it will be the fifth time he returns since his last victory in August 2013 at the Bridgestone Invitational. Should it be cause for celebration? A popular phrase in recent years is that golf needs Woods, but this is only true as it relates to his performance. Otherwise, it becomes a nostalgia tour, and the question facing Woods is whether he can handle being a ceremonial golfer. If that’s what this is about, there would be no need for him to play. This will be the second straight year that Woods makes a celebrated comeback from back surgery in the Bahamas. He had gone 15 months and two microdiscectomy surgeries when he played the Hero World Challenge last year and finished 15th against a field of 18 (Justin Rose withdrew after the opening round with back pain). Woods made 24 birdies that week but finished at 4-under par and was 14 shots behind the winner, Hideki Matsuyama. He was held to a different standard. He was measured by the freedom of his swing more than his score in relation to the field. That began to change when he missed the cut at Torrey Pines in his first start against a full field, and then flew across eight time zones to Dubai and lasted one round – a 77 – before withdrawing the next day because of back spasms. Different about this return is the nature of the surgery, which carried a higher risk and was geared more toward his quality of life. It was a leading question that was more about the uncertainty of his health than his desire to play, and the outlook changed quickly. Within a week, he posted a slow-motion video of a full swing. Then another one of Woods hitting driver, a third video hitting a stinger with a long iron, and news amid this tease that doctors had cleared him to play and practice without restrictions. For one holiday tournament, at least, Woods will be taking on a short field that is long on power and talent. Does anyone really think he can dominate the likes of Dustin Johnson, Jordan Spieth, Justin Thomas and Brooks Koepka the way he once ruled his sport? The numbers suggest otherwise. 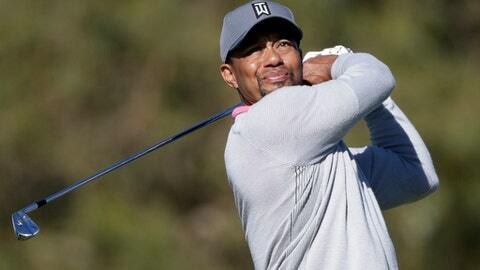 Woods turns 42 at the end of the year and he has gone through eight surgeries – four on his left knee, four on his back. It would be foolish to declare that he can’t by measuring Woods against the entirety of the PGA Tour. Woods announced he will play the Hero World Challenge on the week that Rod Pampling defends his title in Las Vegas. Pampling, once a frequent practice round partner of Woods at the majors, is one of the shorter hitters and won last year at age 47. Koepka was the runner-up. Pat Perez is 41 and doesn’t overpower courses. He has won twice in the last two years and now is No. 18 in the world. Even without winning over the last four years while suffering from back problems, Woods has built up an enormous mystique from the previous 18 years that produced 79 victories on the PGA Tour. Thomas won five times last season. Spieth and Jason Day each won five times in 2015. Woods had 11 seasons with at least that many victories, and he had six years when he won seven times or more. ”Imagine combining the year Jordan had, the year Jason had, the year Justin had. That was Tiger Woods for my whole junior career,” Koepka said. That’s why his fifth comeback since 2014 still resonates with hope. The PGA Tour celebrated the announcement of Woods’ return on Tuesday with a tweet that said, ”The fist pump is back.” For now, the only fist pump belongs to those who are eager to see him play because they were not sure they would get that chance again. How long that lasts depends on Woods.